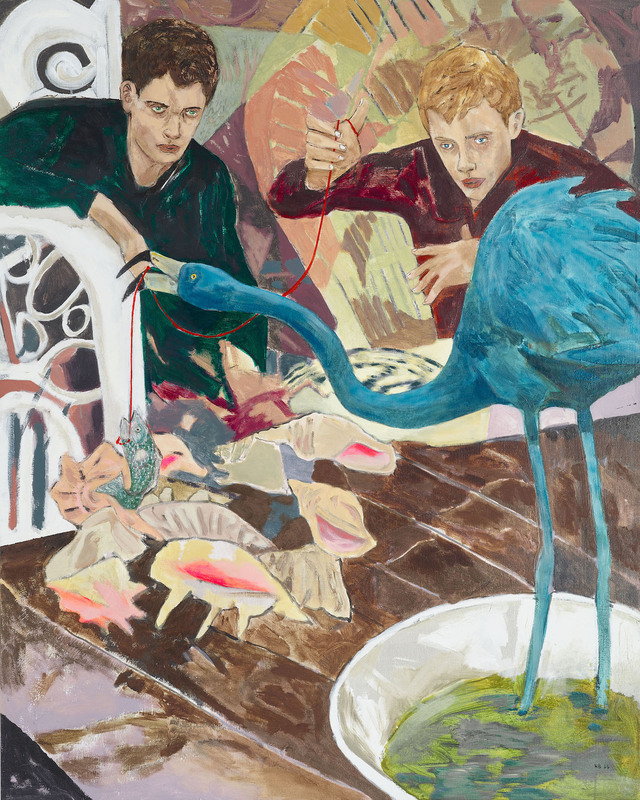 Aloof, gay waifs appear as persistently in Hernan Bas’s paintings as saints in a cathedral. 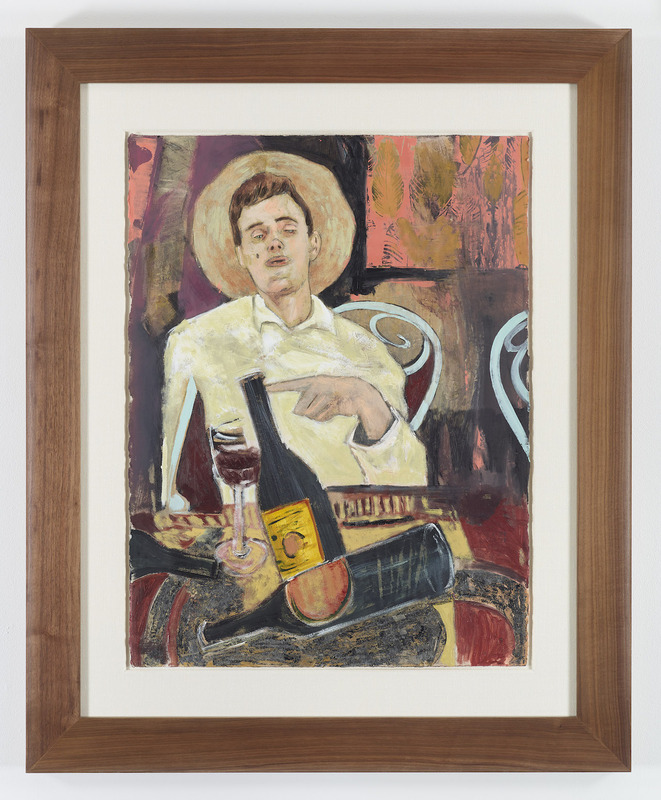 While the young men that appear and reappear in his canvases have become somewhat of a trope, Bas’s compositions nonetheless arise from obsessive research and idiosyncratic material experimentation, as well as a seriously funny sense of humor. His latest body of work, titled Bright Young Things, is no exception. Immersing himself in the history surrounding the aristocratic elite of 1920s London, Bas identifies a certain emerging permissibility of homosexuality within the period. Reimagining the largely undocumented historical moment, the series collapses Art Deco motifs and early Modernist perspectival conventions with a contemporary conception of queerness. Drawing parallels between the unapologetic decadence of the period and the indulgent superficiality of the contemporary present, Bas asks us to consider how and why clichés are born. His trans-historical gay archetype begins to feel rooted in a specific historical moment, economic class, and race, unearthing challenging yet humorous assumptions about queer performativity and imagery. Kenta Murakami: It’s interesting seeing works focused so specifically on a historical moment or milieu since there’s something that feels so contemporary about the figures in this series. What drew you to work with this time period or culture? 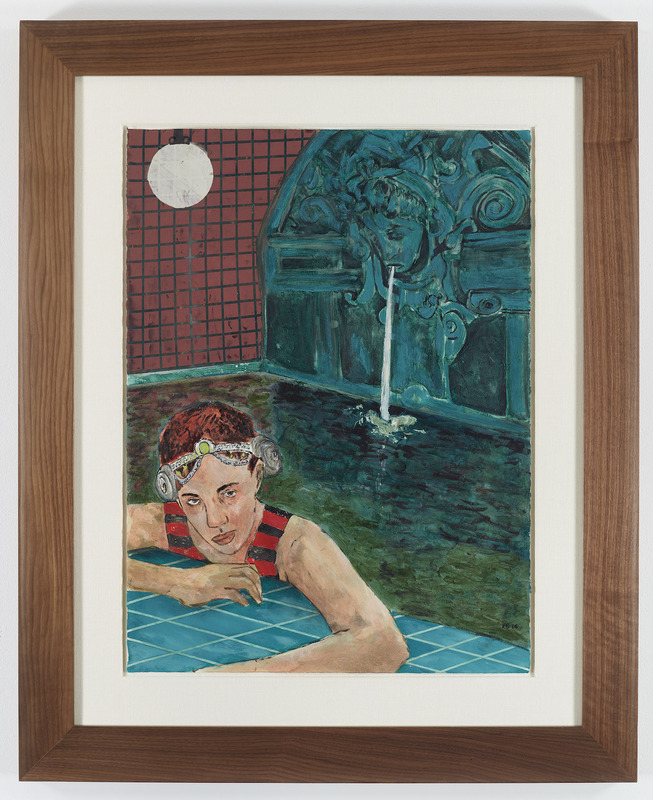 Hernan Bas: I had a series a long time ago that had touched on the English eccentrics, but it wasn’t specifically about the Bright Young Things, so when I was packing up my old studio I found a book on Steven Tenant and thought that I should look at it again. So that sort of catapulted the whole series. I think it was a minor interest that ballooned into a series, which is kind of how I always end up working. So for me, when I started reading about these characters, it did seem intensely modern and appropriate to what’s happening right now. Even just the idea of the selfie is very much an offshoot of these kinds of characters. That self-obsession of making yourself into these characters that are all outward. It’s all about how people perceive you, and I think these characters sort of embody that. They’re basically caricatures of themselves. KM: Is your interest in the past tied to some kind of reimagining of queerness or gayness? HB: I think in a weird way it’s an effort to rewrite history. Because those paintings didn’t exist at the time, and they should have in my head — like why wasn’t someone painting these people in the ‘20s? I mean, Cecil Beaton was photographing them but that’s kind of the only record. KM: There is a certain disaffected or melancholic pathos that surfaces in a lot of your work. Do you feel like that comes from somewhere autobiographical or do you think it’s more an interest in cliché representations of queerness? HB: It’s a weird thing. I always get that response from the work, and it’s something I’m completely unaware of when I’m doing it — in terms of the sighing, and the hands, and flippant attitude. I think a lot of it stems from my early, early work where I was referencing a lot of fashion. When you look at men’s fashion magazines the boys always have that “I cannot be bothered” posture. And it’s weird to me that that has a gay implication. KM: Perhaps that ambivalence can be our version of an outer shell? HB: Maybe that’s part of it … It’s not the easiest thing growing up gay, so I think there is that pathos for sure. But I think someone mentioned earlier that these characters in the show seem a lot happier. So I’m kind of in a mood to paint less depressed characters. I mean, I guess there are still moments where they’re sort of … tired. I don’t know, maybe it’s my schtick. KM: How did you approach narrative with this body of work? I was reading an interview where you talk about how you start very abstract and then start to find figuration, but with this series it seems different. HB: It’s not the most exciting answer, but I just had a show in Paris that opened in October, so this was the tightest period of work that I’ve ever had to do. It was so focused as a result of the time restraint. I feel like I wanted to get as many of the ideas I’d read and researched about into as many works as possible in a very little amount of time. I tend to work from solo show to solo show with a body of work that’s very specific. And they rarely carry over to the next show. I’ll revisit old themes, but a broader version of them. KM: Another thing that surfaces in this series is a sense of the ritual. 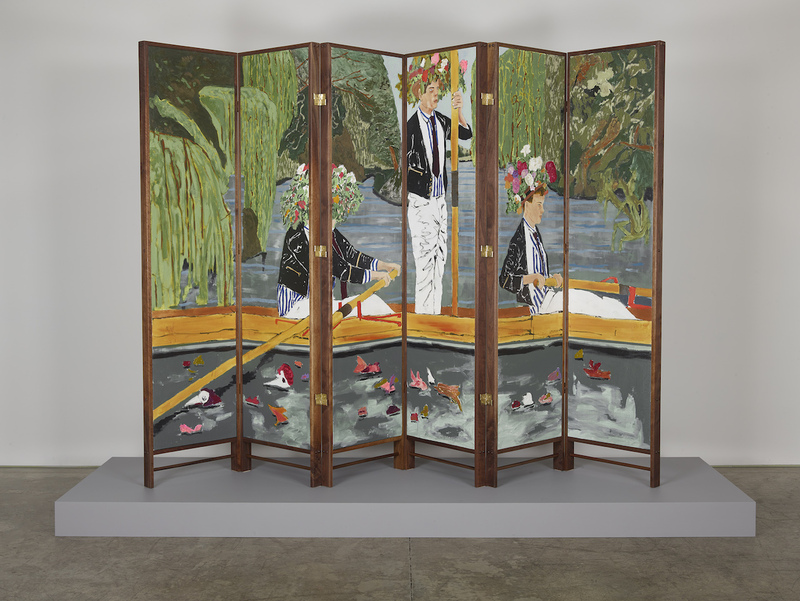 I feel like the middle figure in the screen, “The Fourth of June (Eton),” has a Gauguin-like severity to it that gives the panel a quasi-religious sensibility. HB: I think these characters lived ritualistic lives, although not in a religious sense. They lived by certain codes that they wrote for themselves. You know, you sleep until noon, you check to see who’s dropped their card off to hangout later. You go to the country, then you’re off to school. They’re creatures of habit, you could say. Obviously it’s a very wealthy person’s ritual; someone who doesn’t have to worry about the day to day of paying bills. The most contentious part of their lives was dealing with their parents and their trust funds. KM: A lot of your landscapes have a sort of post-apocalyptic sense to them. With this series, the same kind of energy has been replaced with a decorative abundance and a kind of early Modernist exoticism. HB: For me, the decorative is perhaps a little more autobiographical than I would like to admit because — as gay as it sounds — I’m really into interiors. You know, I read Elle Décor on the plane. Like when I was doing the Memphis body of work, I was looking through Elle Décor and one of my paintings was in somebody’s house in the magazine. And it looked great. They painted the wall the exact color I would have done it. So I’m very aware of that placement of paintings within a space. I was looking at Whistler’s “Peacock Room,” for example, where the paintings don’t exist by themselves but in the context of a room. KM: In a 2011 interview, you said, “Something just always has to be a little wrong. I don’t want to make a right painting.” Why is that? HB: I think part of that quote is my being unable to make a right painting. I was walking around the Met today looking at these master paintings and thought to myself — I was looking at a Sargent painting — “If I could paint that way, would I?” And I couldn’t really answer the question. But I’m never going to be John Currin and I’m just going to be OK with that. Some people are master painters and some people just make images that they think are interesting and that are painted with fun and flurry. 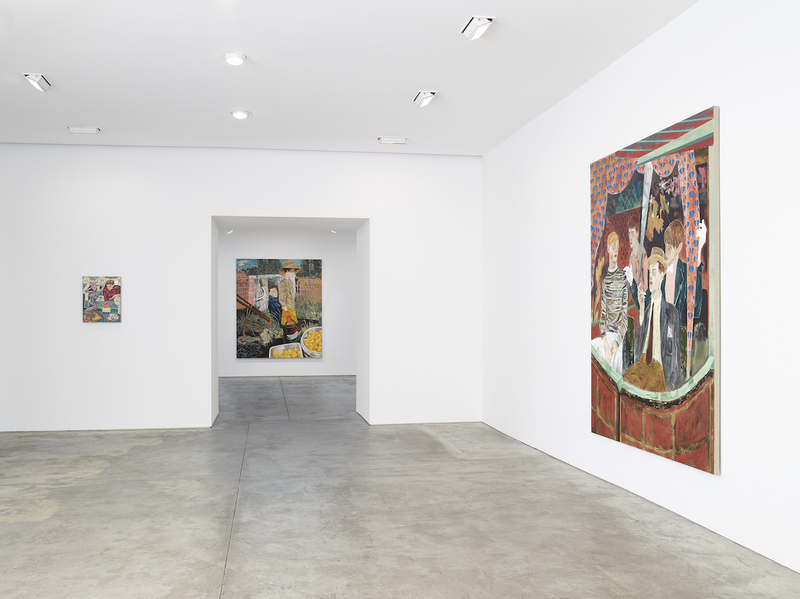 Hernan Bas: Bright Young Things continues at Lehmann Maupin (536 W 22nd St, Chelsea, Manhattan) through April 23.